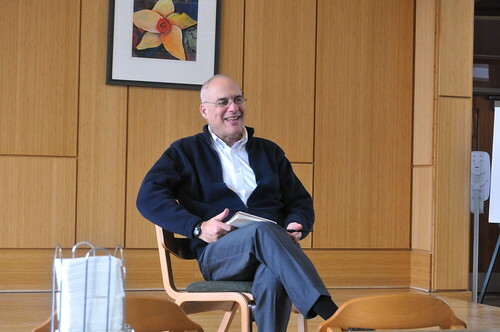 Did I mention I met Mark Bittman the other day? I guess I meant to, but didn't get around to it. He's one of my heroes, a New York Times food writer and powerful advocate for whole foods instead of processed foods. One of his relatively offhand comments while meeting with Dining staff (I was dispatched to take pictures) was that someone had left a collection of ten granola bars in the dorm room (sorry, residence hall room) he's staying in for his visit, and in the long list of ingredients on even the relatively simple ones, the second ingredient of every single one was sugar. In some cases it was "high maltose corn syrup," obviously trying to get past the anti-high-fructose folks, or "brown rice syrup," which at least isn't made from corn, but when you get right down to it, the stuff was loaded with sugar. So I'm coming to grips with the fact that I should stop eating granola bars for breakfast nearly every day. I've known for a while that they're little better than candy bars, but have been convincing myself that they've got whole grains and fruit and/or nuts in them, they're better for me than bagels (serious carb bombs) or donuts, and they're better than nothing. But... maybe not. This morning I had an avocado for breakfast, because I grabbed a few avocados when they were on sale for $1 each at the P&C a few days ago. That feels too expensive for a daily breakfast, though, compared to 30-50 cents for the granola bars, and it's hard to keep the balance along the spectrum of not-ripe-enough to too-ripe. The same is true of bananas, which are also pretty high-carb to eat too often, though I sometimes grab one on the way out of lunch (we're allowed to take a piece of fruit with us from the dining halls) for the next morning. I wish I could imagine cooking something every morning. I'd make eggs, which I'm pretty satisfied are good for me, and I'd try to avoid adding too much meat or bread too often. Oatmeal packets aren't a bad idea, either at home or once I get to work, as long as I'm careful not to buy the too-sweetened ones. Doesn't make a good eat-in-the-car option. Maybe hard-boiled eggs, though I don't enjoy peeling those, and they only stay good for a couple of days. I'm open to suggestions, but don't be offended if I've already got a reason it's not gonna work! Affordable, doesn't require morning prep time, and can be eaten while driving are key factors. i do low carb and end up eating cheese sticks for breakfast pretty often. they fill me up until lunch and i can eat them while walking to class. Cheese is on sale at the supermarket pretty often, and I could definitely hack off a few chunks pretty easily for mornings. Have to see how "natural" the individually wrapped cheese sticks look, too. Thanks! All of the cheese sticks I've purchased are mozzarella, and don't seem to have ingredients I wouldn't expect in mozzarella. I find hard-boiled eggs work make for satisfying breakfast food, but I hear you on the peeling thing. I usually put a little dot of sriracha on mine. Have you priced the already peeled ones? I'm fond of hummus and other bean-based dips on slices of cucumber, baby carrots, or snap peas. Veganomicon has some great recipes. Tonight I'm hoping to make and freeze some breakfast tacos. I used to get these from a cart at UT, and they were a great breakfast. I'm hoping mine are as successful. Peanut butter is another thing that tends to have some staying power. It's my favorite thing to do to celery and apples. I've also been known to eat leftover chicken tenders (cold or zapped) or other hunks of meat in the car. I've never made this kind of thing exclusively for breakfast, but I have made extra with dinner to have around for breakfast. I find that yogurt by itself isn't quite satisfying enough, but with a few almonds, it works. My "prep food on the weekend for the weekdays" plans rarely pan out, but this seems worth a try. Thanks! Also. That avocado looks amazing. And so cool that you met Mark Bittman! I miss the big chewy ones from JJ's, but even those sure weren't health food. Very sweetened. I'm sure it's possible to make oatmeal cookies, or granola bars, that are mostly good for you. I should try it. A spoonful of peanut butter, or peanut butter on decent bread, isn't uncommon, either. I could do that more, too. Thanks! If you like it, almond butter is pretty tasty too! I had this conversation with my doctor recently, as I know that I have to start eating some sort of breakfast and that it can't be sugar or carb heavy. But I just don't have the time to cook. She said two things - first, people tend to way overdo it on breakfast. You don't need that much food to get your body going. It's much more important to hydrate yourself adequately after going for 7-9 hours without. She said that if I'm just that rushed, a nice heaping spoon of peanut butter with my vitamin D supplement and large glass of water would get me going. If I had five more minutes, pair the peanut butter with half a banana or an apple. Make a quick sandwich the night before of peanut butter and apple (she even said just on one slice of bread would be more than adequate and make it a half sandwich). The sandwich could be eaten on the go pretty easily. A spoon of peanut butter can be done in a minute in the kitchen. I think *any* food that you can eat on the go and that satisfies your needs is fine for breakfast. Maybe a can of V-8 (low sodium for me) and some cheese or organic jerky? I've also found that taking the time to make a smoothie is a good thing. I'm a big fan of using coconut oil and some peanut butter in a smoothie mix - then it's just a handful of frozen blueberries, a handful of spinach, a tablespoon of peanut butter, and a teaspoon of coconut oil and enough milk to blend it. I invested in a Ninja blender and it's powerful enough that it takes 30 seconds to blend it, and it blends right in the cup. I take out the blade, rinse that off, twist on the lid and I'm out the door. I've got it down to a five minute process in the morning. And another thing that Mark Bittman and Michael Pollan and all of the whole foods approach people say - if your health and what you eat is important, you learn to find those extra 5-20 minutes a day to take care of yourself. It's a lesson I'm still learning. Do share what works for you. It might help spark ideas for me. I recall reading somewhere that a glass of whole milk actually makes a pretty balanced and calorically reasonable breakfast. Like a diet/nutrition shake, but without all the crap. Also, if a little bit of prep is OK, coat a glass bowl with spray oil, beat and egg or two in it, nuke it for a minute or so, and then slip it into a tortilla. Bang... portable hot breakfast. Ugh. Granola bars are no better than candy bars. Might as well have a Snickers. Yogurt and a healthy shot of fruit juice in a shaker bottle. Voila! Drinkable yogurt! Rinse it out when you get to work. Or, yogurt and some frozen fruit in a blender. I have a magic bullet, and rinsing it is just fine. Takes very little time. I made a double batch and froze them, now I split them and warm them up with a sausage patty (you can get vegetarian ones!) and a slice of cheese-PERFECT breakfast sammich! Make your own "granola" by going to the bulk section and mixing up your favorite nuts and dried fruit in a bag and eating a portion of that with yogurt or a glass of Kefir for breakfast. Yeah, the granola bars are not great ... and no matter how you cut it, a carb is a carb is a carb. I know what you mean about the bagels - I recently had to give them up because they were jacking my sugar too far up. There's this thing called the glycemic index - if you find it on line, it will tell you which foods are high as well as low on that index, by the levels of sugars. Yup, things like bananas are up there, as are oranges. There's other fruits that are much better for you - I personally am allowed any fruit with the word "berry" in it - low in sugars and high in vitamins etc. As for eating in the car - I can't do it. I had to make a lifestyle - routine change, and have for some time given myself the time in the morning to have a bowl of non-sugary cereal and milk with my meds. I had no choice, really, and it takes no more than 10 minutes to stick some cereal in a bowl, pour some milk on it and gobble it down. It doesn't have to be an enormous bowl either - I have, like, a mere cup of cereal and it's plenty. If I have some, in season, I put some fresh berries on as well. If you can consistently swing an extra 10 - 15 minutes in the morning, this might be a solution for you ... and it's healthier than a granola bar at least !